Last night, Mom's birthday, the kids were behaving. If that wasn't gift enough the kids made finger paint artwork. Luke quickly lost interest but Alyce embraced the project and made a few pictures. My favorite is one I'll title "beach". 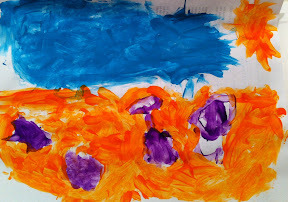 Alyce made a nice blue sky, orange sand, orange sun, and a purple shovel, bucket, and sea shells. I liked it so much I asked Alyce if I could bring it to work. Initially she was apprehensive but after Mom told her she could make another picture after breakfast she was ok with me making off with it.